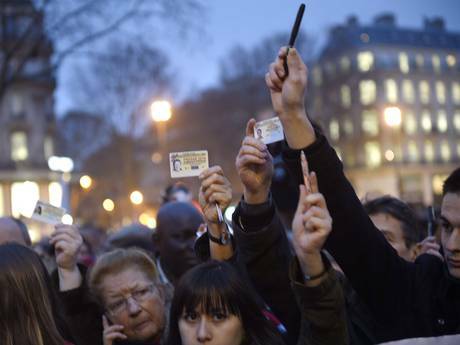 Parisians join a memorial for attack victims on January 7, 2015. Photo © The Independent. French government prosecutors opened an investigation last week into new credible death threats against surviving members of the staff at Charlie Hebdo, an anonymous source told Le Parisien newspaper yesterday. The threats came by mail and on the magazine’s Facebook page over the space of a few days earlier this month. The public Facebook comments have since been deleted, and the magazine has made no official statement on the investigation. Le Parisien’s source said that the threats “clearly mentioned wanting to physically attack the journalists of Charlie Hebdo.” The staff is still under police protection after the attack that killed 12 people in January 2015, and the location of its new office is undisclosed. The anonymous source, identified as being “close to the editorial staff,” said it had been quite a while since the magazine received such direct threats. Staff cohesion and morale have suffered under the stress of the attack’s aftermath, however; surviving cartoonist Luz left the magazine last year, shortly after he and 14 out of 19 other staff members published a joint editorial in Le Monde, calling for the magazine to become a cooperative with all employees as equal shareholders. The editorial expressed concern about mismanagement of funds that flooded in through donations and new subscriptions after the attack. Details on the most recent threats are scant, and we’ll post more information if it becomes available.